New England – Maine and New Hampshire especially – has a problem with carpenter ants. 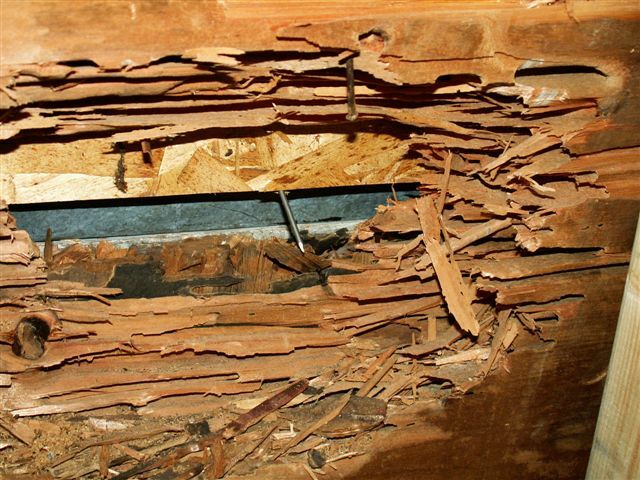 Like termites, they destroy wood and weaken the integrity of your home. Across the U.S., carpenter ants are responsible for thousands of dollars in structural damage. 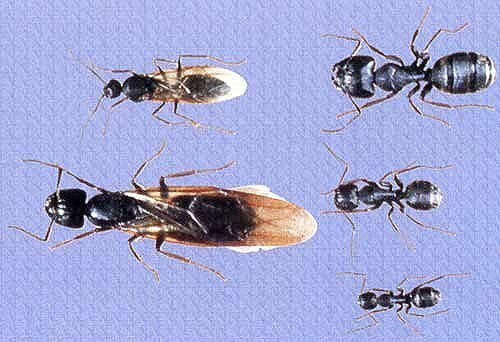 Many homeowners in New England are aware of these destructive ants, but many don’t know what they look like or how serious an infestation is. Carpenter ants are polymorphic – they vary in size from about ¼-inch to ½-inch long. Some are all black, and some are black with red. Unlike termites, carpenter ants don’t eat wood. Instead, they shave off small bits of wood with their strong mandibles and carry them out of their nest, forming piles of sawdust. If you’re lucky, you will see a pile, but most of the time these piles are hidden inside of walls. A single colony of carpenter ants can contain tens-of-thousands of workers whose sole duty is to forage for food and water, excavate tunnels in wood for their growing colony, and protect their queen. A single colony can be comprised of many satellite nests around a reliable source of food and watr. There could be dozens of small satellite nests around one main nest. When a carpenter ant queen first establishes a nest, the ants she produces will be small. A lot of homeowners mistake them as pavement ants because they are about the same size. Over the next year or two, the eggs that the queen lays will form larger ants – up to ½-inch. These are still foraging ants. When a nest is mature, swarmers will emerge. 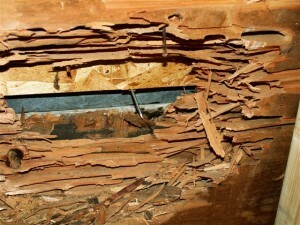 Carpenter ants can cause extensive damage if signs are ignored. It takes 3-5 years for a carpenter ant nest to mature to the point of producing swarmers, or winged, reproductive carpenter ants. Female swarmers are HUGE! They’re close to an inch long and have brown, translucent wings. Males are about half the size as the females, and they have wings as well. When a male and female mate, the male will die, and the female will lose her wings and start a new colony. Swarmers emerge mostly in the spring, but they will continue to emerge throughout the summer. Half the battle of controlling carpenter ants is locating and treating nests either in the home or nearby. They don’t always make their presence known to homeowners, which makes controlling them difficult at times. The other half of the battle is preventing carpenter ants from nesting in your home. 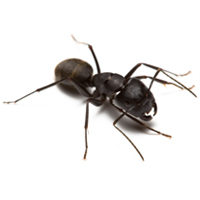 The point of carpenter ant control is to prevent structural damage from carpenter ants. This involves routine visits to inspect for ways carpenter ants can enter the home and for possible nesting areas around your home, along with preventative treatments to kill ants before they make themselves too comfortable inside. Every season brings a new threat from pests. Be prepared. Modern Pest Services offers a HomeCare Green Program for year-round pest protection, as well as Wildlife, Termite, Mosquito, Tick, and Bed Bug Control Services. 1-888-997-3312.